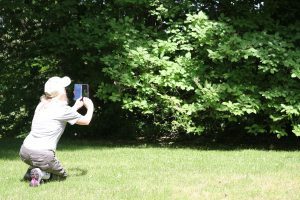 On June 16th, the Land Trust hosted the Uxbridge BioBlitz on one of our protected properties. Since the program started in 2016, volunteers and experts like you have joined us for 6 BioBlitzes, finding and identifying over 1100 species! For this 7th BioBlitz, we’re sharing our top 7 most interesting parts of the day, in no specific order. An alarm clock ringing at 4am may not sound great but waking up with the birds sure does! We were up before the sun and ready when birds started calling at 4:30. Early birders were rewarded with seeing and hearing 42 species of birds throughout the day, including Ruby-throated hummingbirds, Mourning Warblers and the Eastern Wood-Pewee, a species at risk. 2. Dragons, Spiders & other ‘Bugs’! Insects and spiders aren’t just creepy crawlies, they are super interesting! We got up close and personal with centipedes on the ground, caught dragonflies from the air, and found spiders along the edges of the trails. 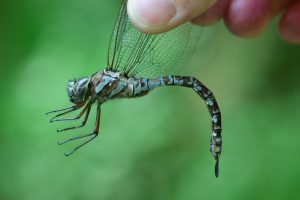 Volunteers found a beautiful Canada Darner, along with close to 40 other species of spiders and other insects. As the day warmed up and the sun came out, so did the butterflies! The ‘papparazi’ were busy snapping photos of a Canadian Tiger Swallowtail that landed at basecamp, while other butterflies fluttered by, including a Viceroy (Monarch mimic) and a tiny blue Spring Azure. We recorded an astounding 36 species of butterflies and moths! Monarch expert Mikal also did a milkweed survey around the pond and found two plants that each had Monarch eggs on them. Unfortunately, our fungi finders didn’t have as much luck. They searched high and low and only managed to find a few, dried up mushrooms from last year. Our almost non-existent spring, and a very dry start to the summer didn’t, didn’t add up to ideal conditions for fungi to grow. Patricia, our mycological expert, noted that this year had the worst start to the fungi season since 1991, which had one of the hottest, driest summers on record (at that time). From pine plantations to open meadows, this property had a lot of habitats to discover. At the end of the day we identified a whopping 200 species of ferns, flowers, grasses, sedges, trees and shrubs. The ‘find of the day’ was the Pipsissewa plant, which many had not seen before. Once the birds stopped flying around dusk, the nighttime critters took over. With the help of bat expert Chris Ketola, we watched Big Brown and Hoary Bats swoop over the pond to take a drink of water before heading out for the night to feast on insects. Once the sun set, the forest was lit up with the sparkle of fireflies, as the flying squirrels chattered away from the tree tops. It really was a magical night! We could not do this without YOU! From pre-dawn to dusk, 44 dedicated volunteers discovered that over 400 species call this protected property home. Thank you all for contributing your time, knowledge, and enthusiasm – it’s our volunteers that help us to learn so much about these protected properties and the biodiversity of our natural environments. What was your favourite part of the day? Let us know! 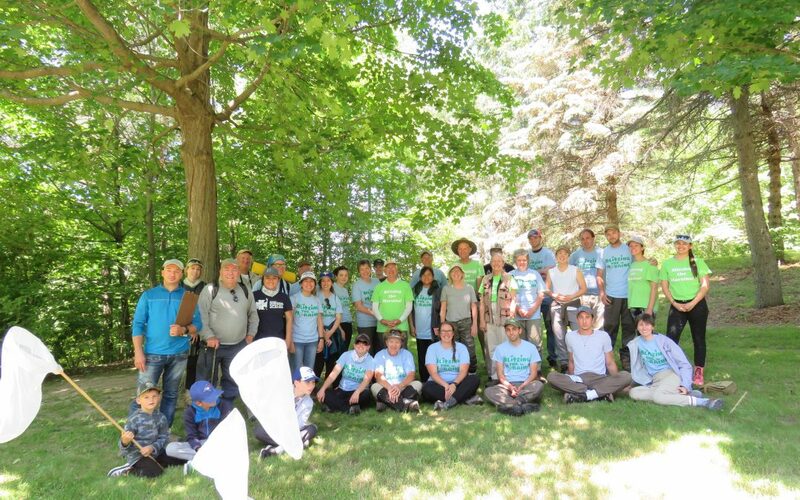 Thank you to our many amazing funders for making this day happen: Ontario Trillium Foundation, Patrick and Barbara Keenan Foundation, John & Pat McCutcheon Charitable Foundation, Pratt & Whitney Canada, and the Biodiversity Education & Awareness Network! If you have some identification skills you want to try out, or are looking to improve them while having a “bio”blast of fun, come on out to one of our BioBlitzes. The next two will be held on September 15th and October 13th with more to come in 2019! Visit http://oakridgesmoraine.org/workshops-events/ or give us a call at 905-853-3171 x33 for more information.